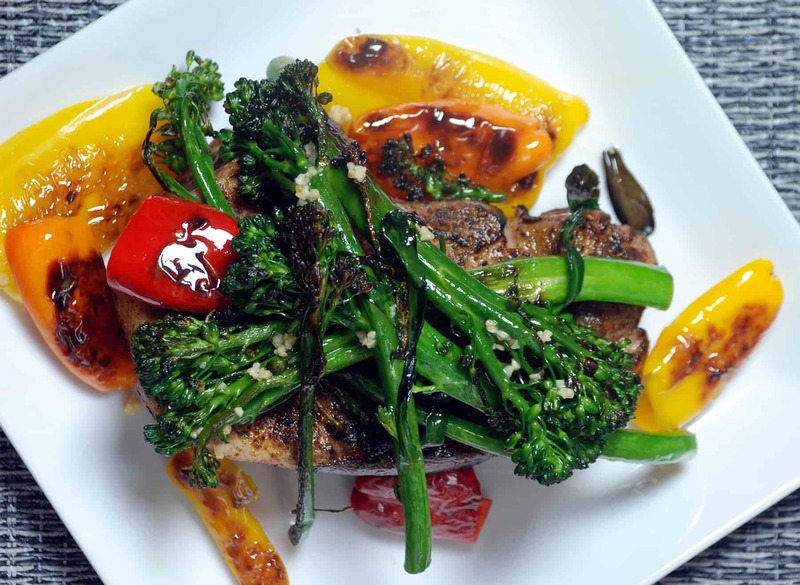 This is a light and healthy recipe combining sous vide pork chops with some broccolini and roasted peppers. It's easy to put together as a weekday meal when you want some great food that doesn't take long to prepare. Pork, much like chicken, is good at many different temperatures and people usually feel strongly about which one it should be cooked at. I prefer mine cooked at 140°F (60°C), leaving the middle a rosy pink which is very moist and tender. However people enjoy it anywhere between 135°F to 149°F (57.8°C to 65°C). So find the temperature you like for pork and stick with it. The time just needs to be long enough to cook it through, and I usually pasteurize it just to be safe. You can refer to the cooking times for more information. If you would like more information about the modernist techniques, ingredients, and equipment used in the sous vide pork chop with broccolini recipe you can check out the following. Mix together the spices in a bowl. Lightly salt and pepper the pork chop then sprinkle with the spices. Place in a sous vide pouch, then add the sprigs of thyme. Seal the bag and cook for 2 to 3 hours, until heated through or pasteurized. Heat some olive oil in a pan over medium heat. Add the broccolini and garlic to the pan and cook until tender. Remove the stem and seeds of the peppers then cut into whole sides. Toss the peppers with olive oil then salt and pepper. Cook under a broiler, or in a hot pan, until they have taken on color and become tender. Remove the cooked pork chop from the bag and dry it off. Quickly sear the pork just until color develops. Place the pork chop on a plate and surround with the bell peppers. Top with the broccolini then drizzle with olive oil and sprinkle with sea salt. 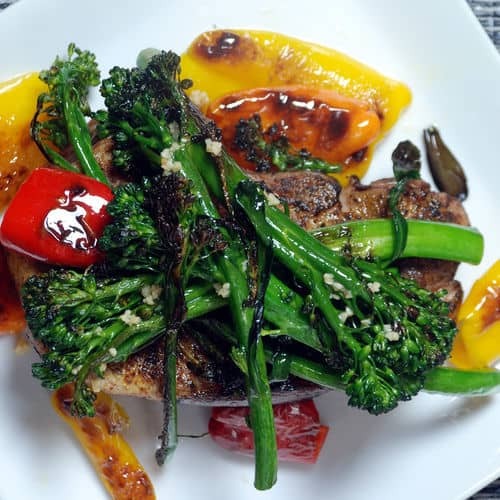 This flavor packed sous vide pork chops with broccolini recipe is easy to put together as a weekday meal when you want some great food that doesn't take long to prepare.